Another Anime Con 2016 is upon us. We will be providing world class first aid and social medical care this weekend. This marks the fourth year we have been to AAC. Our annual Faygo and Raffle baskets Fundraisers are making a triumphant return to AAC this year. Our raffle baskets this year are, Otaku Snack Attack, Music and Art and Pokemon Extreme! We are pulling out all the stops for our Faygo Fundraiser this year. Bottles are 1.50ea and cans are .75 cents each. A 12 pack of cans is only 7.50 and a 24 pack of Bottles is 29.00. You can mix and match your favorite flavors! 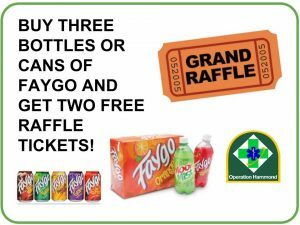 For every three bottles or cans of Faygo you buy you get two free raffle tickets to enter into our fantastic nerd and snack raffles! 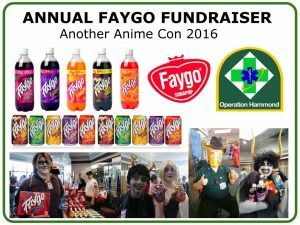 Each year we always sell out of Faygo so be sure to stop by our table early. 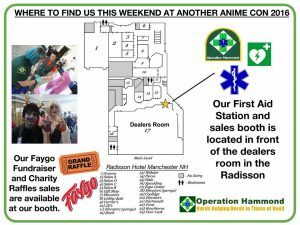 Our booth and First Aid station will be located right outside of the dealers room in the Radisson Hotel. Please don’t hesitate to come to us for help. Nerdfit will be there all weekend running cool fulfilled panels both Friday and Saturday during AAC.